Errol: This is why money in Paypal and Humble Indie Bundles is a bad combination. ^_^ I want to make a quick game and it looks like Kari, Manda and Mark Lindan will help! I hope so, because it’d be fun! 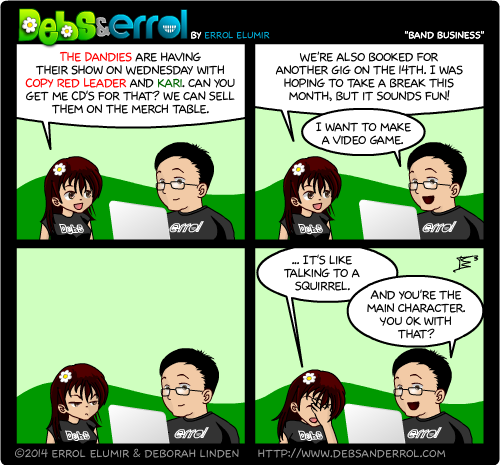 And yes, I want Debs to be the main character. Debs: I’m confused but sure? C’mon everybody! Add your possible game titles here! p.s. What program are you going to use to create this? There’s a good one called GameMaker that has a free version of the program to get started on. We are going to us RPG maker, but not make an RPG. I REALLY liked Construct 2, though, but there were too many assets I had to make on my own. So we’ll see how RPG maker will do! Very excited to work on this! Someday I wanna do the time travel one too :D.
And Debs probably wouldn’t be searching for me! These titles are mucho excelente!